When you experience trouble when uploading your order, this can have multiple causes. We kindly ask you to try the following solutions. First check your internet connection and use a cable if possible. Please note that if you’re using Kaspersky, Norton Symantec antivirus or any other additional anti-virus, you need to adjust it as well (for Norton antivirus adjust the ‘Web access protection’ also). Additionally, we advise you to temporarily disconnect a ‘proxy server’ if you have one. It might also help to have a browser set as standard. We recommend Google Chrome. After uploading, the creator tool automatically opens the online check-out in your browser. If this doesn’t happen, check if you have a browser set as standard. We recommend Google Chrome. 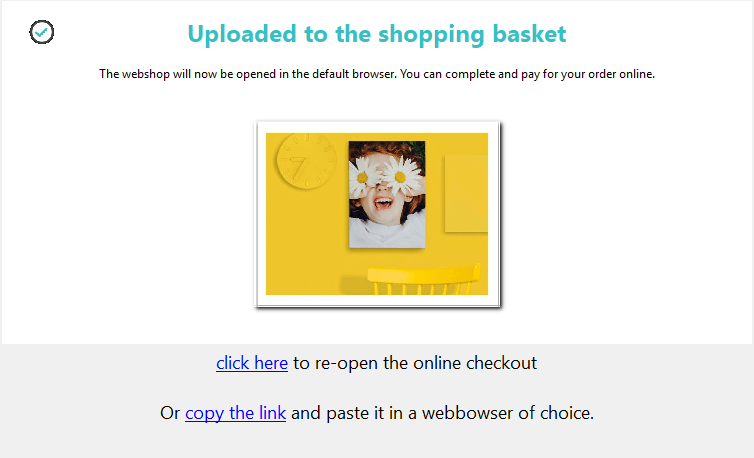 To open the online check-out, try clicking on ‘click here‘ (see image below) to re-open the online check-out. If that doesn’t help, try copying the link by clicking on ‘copy the link‘ (see image below) and paste it in your browser manually. It could also help to paste the link in an incognito window in your browser (for Chrome: click on the three dots at the top right corner and choose ‘new incognito window‘). Issues that occur during ordering can either be due to issues with images used in your photobook (in this case you will receive an error message that tells you which image is the problem), or due to issues with your internet connection or your firewall. Therefore, please first make sure that you are on a stable internet connection when you try to order. Choose Apple menu> System Preferences, click Security and Privacy, and then click Firewall. Click on the padlock to unlock it and then type the name and password of an administrator. If you cannot choose the “Firewall Options” button, first click on “Enable firewall” to enable the firewall for your Mac. Click on the button with the plus sign under the list of facilities and then select bonusprint. After you have added the program, click the arrows to allow connections via the firewall. It might also help to have a browser set as standard. We recommend Google Chrome. When you experience trouble uploading a product that you created online, this most likely has to do with your internet connection or your browser. We recommend Google Chrome as a browser because we know from experience that this browser works the best with our website. Please make sure that you’re using a fast and stable internet connection. It could also help to log out and log in again at the top right of your screen. In this new Window, browse to our website, open the product again and try to order. Use Google Chrome as a browser (most of these problems appear in Internet Explorer). Use a stable and fast internet connection. Try uploading smaller batches of pictures at once. Place them in your shopping basket and click on ‘continue shopping‘ to move on to the next batch. When you have placed all of them in your shopping basket, you can go forward with your order. First check your internet connection. To help you with uploading your product from our app, we would like to ask you to make sure you are using the latest version of the App. You can do this by going to the App Store and searching for the bonusprint app. If it indicates that there is an update available, please select ‘update‘ to install it. After you have installed the latest version of the app, please shut down your device and restart it. Now only open the app on your device and try and place your order again. If you still experience issues ordering your photo product, it could be due to there being insufficient memory on your device. We kindly ask you to delete some data from other applications on your device and free up some available space. Did you try to solve the issue but you still experience problems with uploading? Please contact our customer service team and we will try our best to help you out!